Greenhouses were initially seen to pose a number of challenges for cannabis growers, but as marijuana greenhouse design and technology has advanced, growers are quickly learning that they can get a lot more bang for their buck by growing cannabis in a greenhouse instead of in a warehouse. Cannabis has also proven to be an incredibly lucrative crop for the veteran greenhouse grower with previous experience in vegetable or ornamental greenhouses. 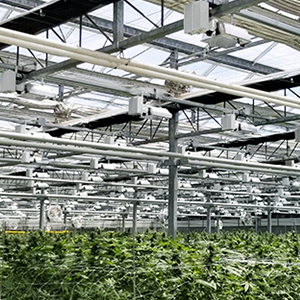 A lot of growers have been able to retrofit their existing commercial greenhouse structures to accommodate the new crop, but retrofitting a greenhouse to grow cannabis has its own challenges with some major considerations to make. However, if done correctly, your cannabis will benefit from the natural light only a greenhouse can provide while maintaining the ability to control the environment for maximum production. Growing cannabis in a greenhouse provides the benefit of natural sunlight, making a greenhouse an incredibly cost-effective method of growing commercial cannabis. Natural light is great for the plants and most importantly, it’s free! Most analysts estimate that by not having to run lights for 12 to 18 hours per day, a grower can save anywhere from 50 to 90 percent in energy costs compared to an indoor grow. However, proper supplemental lighting is still required in a commercial cannabis greenhouse. A particularly overcast day cannot provide the same light intensity of a clear, sunny day. You also need supplemental lighting to extend the shorter days of winter. During the vegetative stage, the crop needs a substantial amount of light over the entire canopy to really flourish. An existing greenhouse may have supplemental lighting, but it will likely not be the layout or intensity required for your marijuana crop. Light deprivation, or blackout curtains, are not necessarily unique to the cannabis industry and are in fact quite common in ornamental greenhouses. Poinsettias, kalanchoes and chrysanthemums are all examples of plants that require light deprivation, but since cannabis is such a high value crop, the quality of curtains in an existing greenhouse, or ability to install blackout curtains in a greenhouse should be thoroughly assessed. Cannabis is a short-day flowering plant and requires total blackout for certain periods to stimulate the plants to flower. It’s also important to install light traps over any exhaust fans so that no light can make its way to the plants. Make sure you work with a reputable greenhouse manufacturer to facilitate construction and ensure you’re getting the best quality light deprivation curtains. If there’s one thing everyone knows about marijuana, it’s that it has a distinct scent. While some people may be impartial to the odor, neighboring communities and businesses may not be. Odor control and air purification is an issue that is rarely a concern in ornamental greenhouses, but for a cannabis grower, not adequately dealing with odor can result in harsh penalties. A lot of areas in Canada and the U.S. have strict regulations in place in regard to odor control. GGS can provide you with odor control systems that can be installed in existing greenhouses. As for areas that currently don’t have regulations in place for odor, it’s not unlikely that there will be in the future so it’s an important consideration to make when designing your commercial cannabis greenhouse. It’s also a good way to maintain a positive relationship with the neighbors. The labor required in a commercial cannabis greenhouse is also largely more complex than in a traditional, ornamental greenhouse. When ornamental crops are prepared for the market, the plants are typically sleeved, boxed and sent to their destinations. Cannabis plants are often harvested and trimmed on site, making the process a little more complicated than in a traditional greenhouse. There is also more labor involved in checking for pests and contaminants in a commercial marijuana greenhouse than there typically is in an ornamental greenhouse. Pests and disease can be damaging to any crop, but a contaminated cannabis crop can cost anywhere from thousands to millions in lost product so it’s imperative that each plant is checked thoroughly. Cannabis is a consumable plant that needs to meet certain health requirements which means there is usually very little growers can spray to avoid pests, leaving the plants that much more vulnerable. As such, labor to check for pests is a lot more critical. With cannabis officially legal in Canada and with more states edging toward legalization, we’ll be seeing many more cannabis growers entering the industry, and likely a lot more opting to grow their crops in greenhouses. Are you ready to get your cannabis greenhouse project started? Call the experts at GGS today!